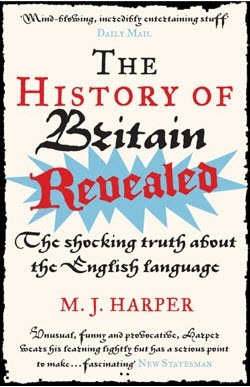 I've recently read ‘The History of Britain Revealed’ by M. J. Harper. It was an incredibly thought-provoking read. The basic premise of it is that the English language is far older than is generally credited. In it Mick Harper refutes the idea that English evolved from Anglo-Saxon and criticises academia for its muddled logic and refusal to re-examine fundamental assumptions on the subject. Other academic disciplines also come under fire along the way, including Darwinism. The arguments put forward in the book are logical and concise, and its written in a witty and engaging way. It’s a must read for anyone interested in Britain’s history. Incidentally, Harper describes himself as an Applied Epistemologist and he can be found online at the Applied Epistemology Library, a web forum that discusses and challenges everything form Einstein to Fomenko. Genuinely new ideas seem to be its forte. It describes its purpose as thus, “to provide you with something that's been sorely lacking in your life thus far, intellectual excitement.” I’ve been enthralled since I came across the site a few months back. It’s a real treasure trove of interesting ideas. I thoroughly recommend it to anyone of a Fortean mindset.